This is a lure which is equally effective in rivers and stillwaters, particularly for rainbows. The most popular colours are olive, black, orange and red. Can be tied on longshank 8s, 10s, and 12s. For rivers I prefer a size 8 wet fly hook. Early season on stillwaters a size 8 L/S olive fished on an intermediate line is a good starter. On my recent trip to N.Z. I had about a dozen rainbows to 3lb. in a fast river all on olive and orange woolley buggers on size 12 L/S in a morning session. 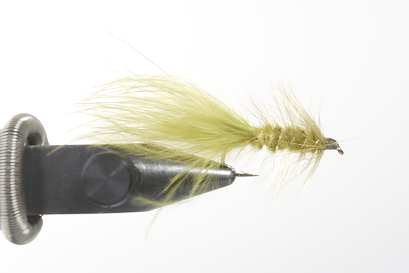 There is little new on the tying of this fly which we have not covered on previous lessons.